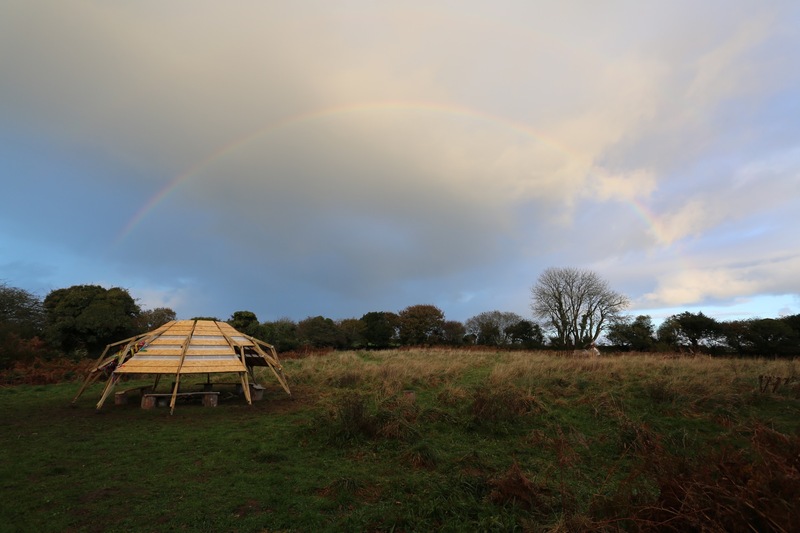 The fire-pit shelter was conceived as a semi-permanent structure to provide protection from wind, rain and sun for the parents, children and staff at the Eden Project Wild Nursery: an outdoor pre-school on the edge of Eden. Using 1:10, 1:5 and 1:1 models the students developed their ideas, project managed the build and pre-fabricated the structure off-site. 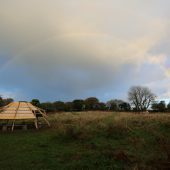 On 9th November 2016 the students reassembled the structure on the Eden Project’s field. Once built, they documented the process of the design and build, through both technical and expressive drawing. Build cost: £1,268. 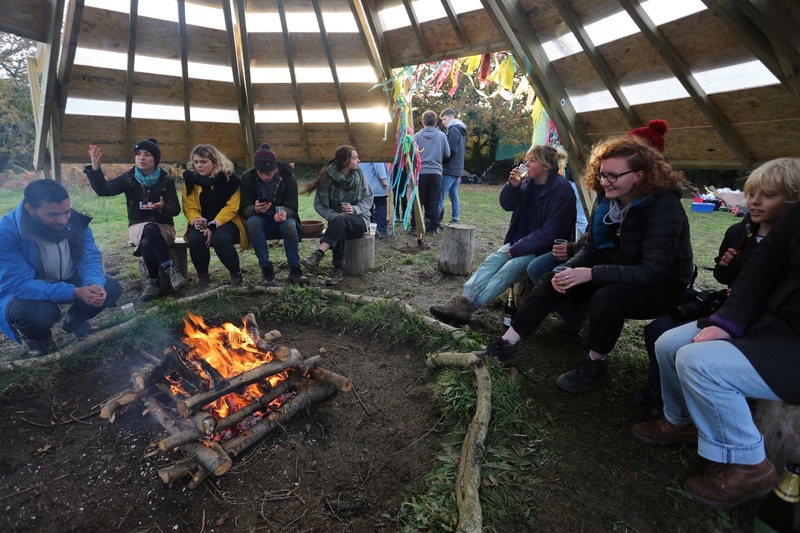 A year before the 1st year architecture students began the design and build of the fire-pit shelter; tutors from Falmouth University architecture degree worked with the Eden project education team to develop a brief for their ‘Wild Nursery’. 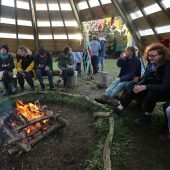 Seven-weeks before the first fire was lit under the shelter, the 1st and 2nd year students met with the Eden team. 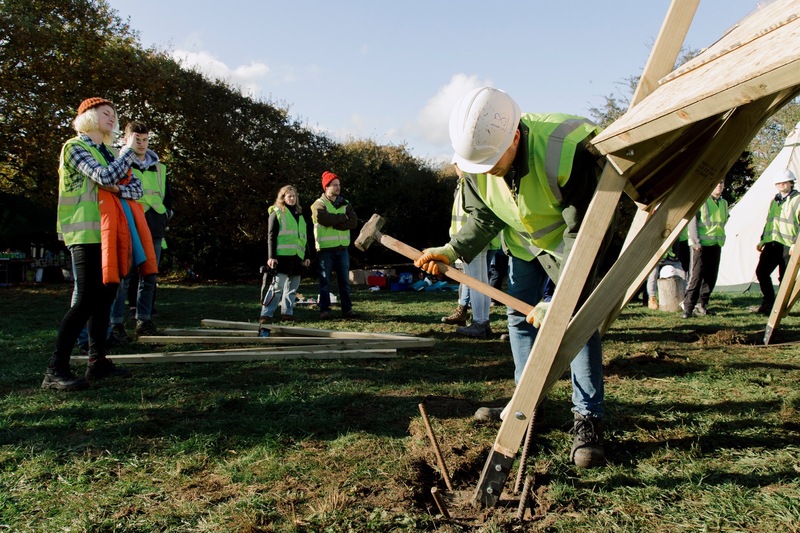 After an initial two-week site investigation – through den building – the 2nd years worked on designs for an indoor/outdoor classroom and the 1st years designed and built the fire-pit shelter for Little Eden, a parent and toddler group that were already using the field. Client: Eden Project – Gill Hodgson (education), Bram Howell (education), Caron Johnson (education) Sam Kendall (education) Jane Knight (Landscape architect), Ben Freight (Health and Safety). Students: Catherine Aalders, Samuel Barnes, William Bingley, George Champion, Fergal Clenaghan, Jessica Everall, Hazel Farnon-Nolan, Theodore Franklin, Neel Gajjar, Ruben Giannini, Chloe Halliday, Laura Harris, James Hayward, Nina Jones, Thomas Lea, Robert Miners, Ethan Nichols, Kyra Oakey, Kayleigh Pearce, Linto Philip, James Pike, Janna Richardson, Ruby Roberts, Robert Stone, Perry Tosdevin, Seline Turner, William Warne, Jack Whittle. Research Question: Building architectural experience: How can heuristic learning provide a strong foundation for students of architecture? 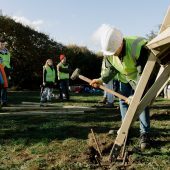 Architecture, Client-funded, Undergraduate, Months, Self-funded, Semi-permanent, 11-50, Collaboration, Curricular, Students with tutor, Cornwall, Falmouth Univ.